So we'd all kill for a 30 inch, 2560 x 1600 monster panel, that's a given. But for those with less lavish means - not to mention less glamorous graphics cards - such resolutions are nigh-on impossible to attain. The current standard is 20-22 inch panels, which amounts to resolutions between 1280 x 1024 and 1680 x 1050. However, this 19-inch widescreen model from Hanns-G strikes a compromise between price and performance. Its reasonable response rate, combined with its widescreen aspect and 1440 x 900 res, make the HW191D-SB-F an ideal budget panel - it's going for £105 on misco.co.uk . Our first impressions out of the box weren't too hot - the panel appeared a bit dim, but tweaking the controls sorted that out in a flash. And while it's hardly the highest contrast we've ever seen from a flat panel, it puts up a good show with FPS titles, so unless you're used to using the priciest of panels, you'll be content with the results. Colours are bright and vibrant, on the whole. 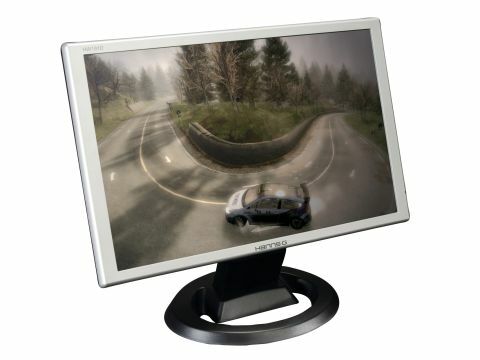 Of course, we'd always recommend aiming for a 22 inch monitor if you can afford it, and the chassis design here is largely devoid of style, but if you're shopping to a tight budget, the HW191D-SB-F is a real winner.